Mike Pence, Trump’s apparent VP pick, is boring, incoherent, and politically inept. But at least Mike Pence has no political future. Indiana Gov. 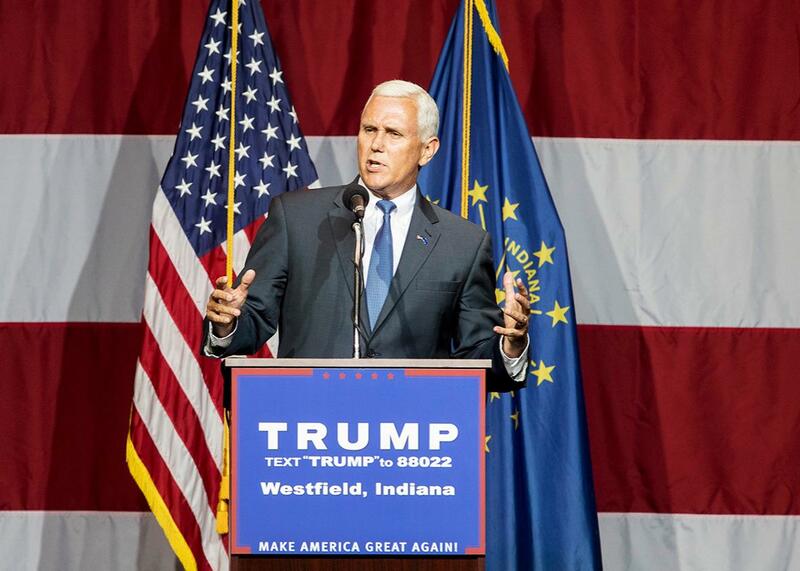 Mike Pence introduces Donald Trump at the Grand Park Events Center on July 12 in Westfield, Indiana. Once again, Donald Trump has shocked us all by apparently choosing the most boring possible running mate. My hope was that Trump would guarantee sky-high ratings for next week’s Republican National Convention by selecting a bald eagle, a daring choice that while almost certainly unconstitutional would have delighted and amused Americans of all ages and that would have underscored Trump’s commitment to protecting what is arguably our country’s most-cherished animal. Instead, reports indicate that Trump has chosen Mike Pence, the not terribly popular governor of Indiana. Many had expected that he would select Newt Gingrich, a skilled if famously shameless communicator who has been one of Trump’s ablest and most enthusiastic defenders. New Jersey Gov. Chris Christie has been auditioning for the VP role for months, though it seems his toadying was just a little too pathetic for Trump’s inner circle to countenance. Tennessee Sen. Bob Corker was once considered a real possibility, but he publicly withdrew from consideration. The newly minted junior senator from Iowa, Joni Ernst, was also in the mix, but she too demurred. There was talk of Trump selecting Michael Flynn, a little-known retired general and former director of the Defense Intelligence Agency, but it all come to naught, perhaps because Flynn, like Trump, has a less than rock-solid track record as a social conservative. One gets the sense that every one of Trump’s options was either too ashamed, too insane, too pathetic, or too embarrassingly obscure to run alongside him. Except for Mike Pence. Pence is a drearily conventional figure who had the distinct misfortune of following Mitch Daniels, one of the brightest bulbs in the GOP, as governor of his reliably Republican state. Despite Daniels’ long and sturdy coattails, Pence only narrowly defeated his Democratic challenger, John Gregg, in the 2012 gubernatorial race. Some have suggested that Pence was eager to serve as Trump’s running mate because he was far from certain that he could defeat Gregg a second time around this fall. Instead of suffering the indignity of an unsuccessful re-election bid, Pence has opted for a higher-profile indignity that might—just might—get him a weekly variety hour on Fox News. Over the course of his long political career—Pence was elected to the House in 2000, where he served until winning the governorship—the Indiana politician has had many deep thoughts. Back in 2006, when then–President George W. Bush was leading the charge for comprehensive immigration reform, Pence devised an ingenious yet almost certainly unworkable amnesty proposal. Essentially, Pence proposed that unauthorized immigrants return to their native countries and then re-enter the United States as “guest workers.” As guest workers, these women and men would enjoy legal status yet would also be denied various rights and privileges granted to lawful permanent residents. The genius of this proposal, if you can call it that, is that it infuriated every possible constituency: opponents of an amnesty for unauthorized immigrants, conservatives who favor reducing immigration levels, and advocates who want to ensure that poor immigrants are not taken advantage of by unscrupulous employers. I’m not sure if you’re aware of this, but one of the biggest reasons Trump won the GOP presidential nomination is that he pledged to strengthen America’s borders, oppose amnesty, and reduce immigration levels. My guess is that Pence will endorse every last jot of Trump’s immigration agenda. But you have to wonder: Can it really be that Trump couldn’t find a running mate who had a clearer, more consistent position on immigration? It doesn’t help that Trump’s immigration stance is almost brand spanking new. There is at least some good news for Republicans in Pence’s selection as VP. Pence has no political future. Had Trump chosen some reasonably together, competent, and appealing candidate, that candidate would have had her or his reputation permanently sullied by the association for years to come. That is not a concern here, at all.